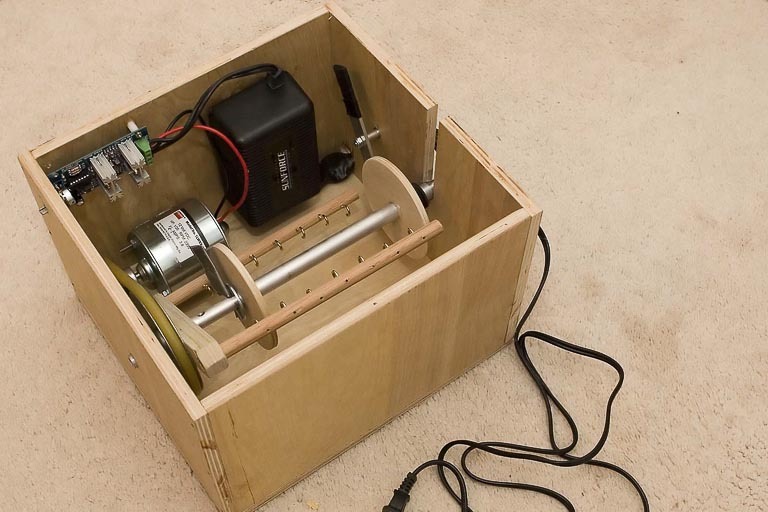 I’ve designed a better electric spinning wheel that is cheaper to make and include detailed build instructions. I also sell kits for this new version. Here is that project’s homepage. This article is dedicated to Emily. Without her love of spinning and knitting wool I wouldn’t have had willing test subject for my wacky spinning wheel contraptions. All spinning wheels have a bobbin and a flyer. 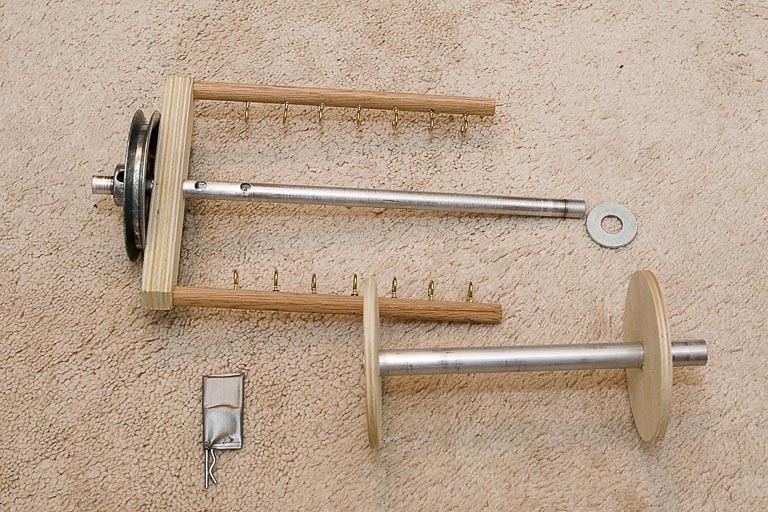 The bobbin holds the spun yarn and the flyer is what twists the yarn onto the bobbin. The big drive wheel on non-electric spinning wheels is just there to help spin the flyer faster. The electric spinning wheel is much smaller because a small electric motor spins fast enough to eliminate the need for the big drive wheel. There are a wide variety of spinning wheels. The one I choose to make is the Scotch Tension design. 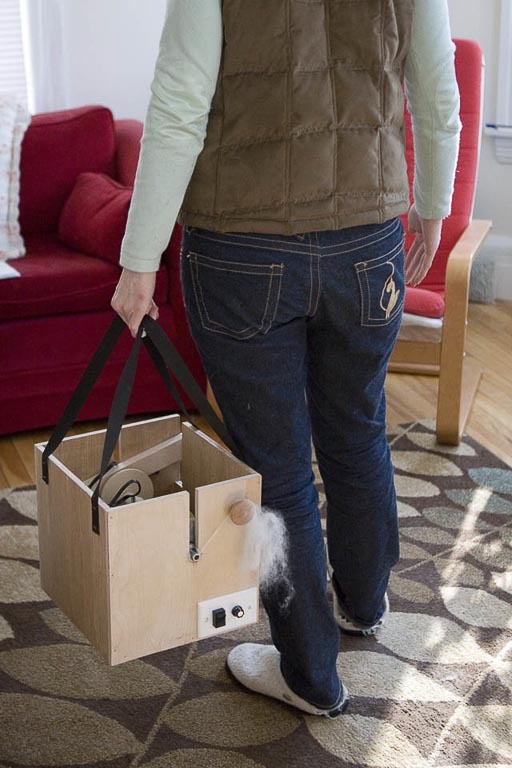 This version uses a brake on the bobbin to control how fast the uptake of the yarn happens. The uptake of the yarn is how fast it is put onto the bobbin. A slower uptake means the yarn will have more twists per foot. Different types of yarn require different amounts of twisting. This simplification leaves a lot out and you can read more about spinning wheels on Wikipedia or by searching google. The main advantage to an electric spinning wheel is that it can be made smaller and is thus more portable. Another advantage is that getting a good well balanced mechanical spinning wheel can be tricky and an unbalanced wheel isn’t as easy or fast to use. I’ve found that electrical ones can be built for between $50 and $150. Mass produced electrical spinning wheels cost $2000 and cheap looking pvc ebay models sell for $300-$500. I really feel this market is being exploited and it would be awesome if this article starts a little more competition. Like most engineering problems it took me a few iterations to get everything working well. Below are the five versions it took me to get everything working well. This version was never completed. It never spun any wool, but it helped me understand the workings of the bobbin and flyer. The second iteration worked well and it cost me around $50. It used a cheap surplus AC motor. The big problem was that this version was it was constant speed and Emily wanted it to go a little faster. I tried adding a resistor based dimmer switch to my system to control speed of the motor. The dimmer switch’s packaging specifically said not to use it with motors. While I thought I knew better, but it turned out that I didn’t. I seemed like it was going to work, but after a little while the switch released it’s magic smoke molecules. If you don’t need variable speed I’d suggest getting an AC motor like this. At $10 this motor is a steal. You can use a standard lighting switch to turn it on and off. 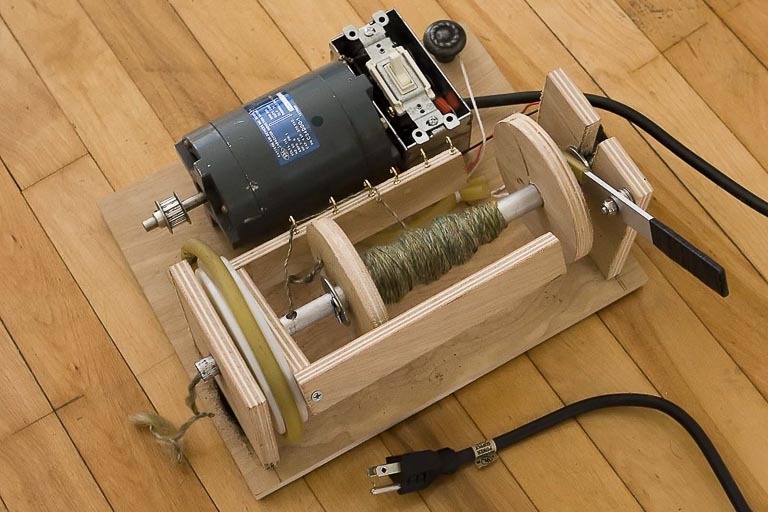 I also wired in a switch to reverse the motor which can be useful since you spin yarn in one direction and then ply strands of yarn together in the other direction. 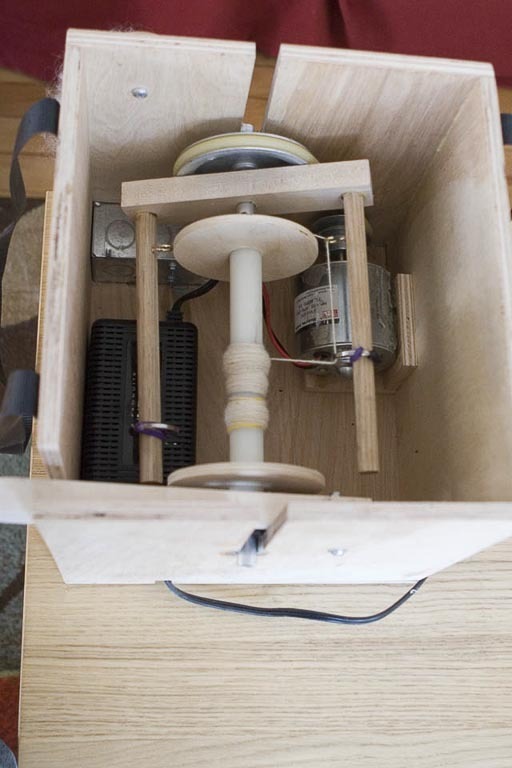 Version four used this dc motor, power supply, and motor controller. I had avoided DC because it’s more expensive, but it’s still only around $100 with these parts and I’m sure with some searching cheaper parts could be found. One issue I had to solve is that the motor controller by default pulsed at 260 hz which gave caused an annoying hum. I increased the pulse frequency on the motor controller so it was outside the human hearing range by replacing the 470K ohm R5 resistor with a 47K ohm resistor. In theory this reduced the efficiency of the motor, but it still seemed to have enough power for my needs. This version worked fine for a few minutes and then the magic smoke molecules were released. I never liked this motor controller so my next version needed to buff up the motor controller. I kept the box the same as my last version. All I did was change to using the SyRen 10A motor controller and put this battery in parallel with the power supply. The reason I put the battery in parallel is to protect and sink the energy from the SyRen regenerative motor driver. Here is a good tutorial with a little more info about this. An added benefit of the battery is you can use the spinning wheel for an hour or two in remote locations. This has turned out to be very useful for Emily. I’ve been extremely happy with the SyRen motor controller and if I ever need a high quality motor controller in the future I’ll certainly consider using this or one of the other SyRen controllers. The best news is that this version of the electronic spinning wheel works great! Here is a video of Emily using it. The motor and electronics I used are linked above. I used these pulleys (smaller, bigger) from McMaster. I also order these aluminum pipes (smaller, bigger). The rest is just wood, bolts, washers, a spacer, an elastic strap, glue, and 6 inches of 1/8×3/4″ aluminum bar. I got all this stuff from Home Depot. I estimate the total cost to be around $150 and this would be less if you built more than one since there is a lot of extra material left after the build. I’m also sure I could find cheaper versions of many of the parts if I did more searching. 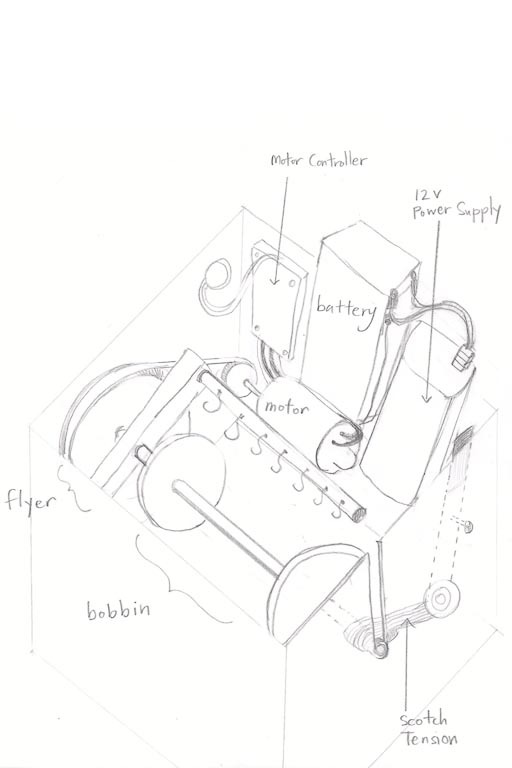 Here is a diagram of the my electric spinning wheel. The bobbin can freely spin on the flyer. If there was no brake on the bobbin then it would spin at the same speed as the flyer and the yarn would get very twisty, but it would never get put onto the bobbin. The scotch tension brake causes the bobin to spin more slowly than the flyer allowing some twist to the yarn and some uptake. Uptake is the term of the yarn getting pulled onto the bobbin. If you applied a full break so the bobin never spun then there would only be uptake and the yarn would have no twists which would also not work. Spinners know that they need to adjust the Stotch tension brake to get a good mix of uptake and twist. The less twists in the yarn the fluffier it is. Knitters will want different amounts of twists in their yarn depending on what they are knitting. 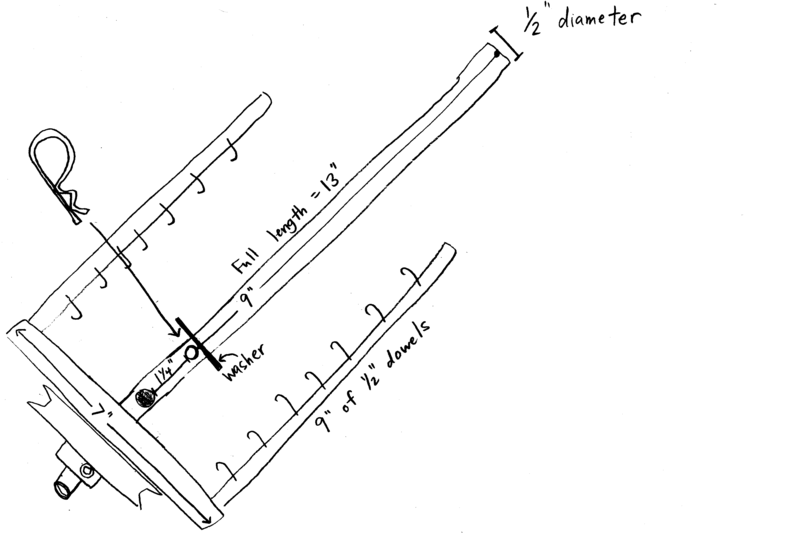 Here is a diagram and picture the explains my flyer/bobbin design. That should do it. If you have any questions let me know in the comments secontion and I’ll try to answer them. I’ve made some improvements by adding nylon bushings, a box to hold the electronics, and a redesign of the frame. Here are some pictures. The last picture shows how I added some straps to the frame. 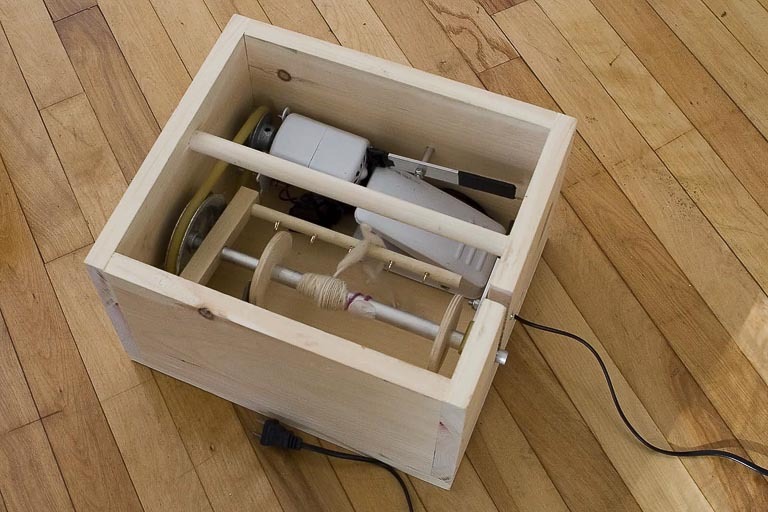 This makes the electric spinning wheel extremely easy to move. This has been a big plus with spinners who often what to move it around. Here is a video showing how to use the spinning wheel. Here is a video showing how to setup and adjust the spinning wheel. There are nylon bushings that I got from home depot. These are embedded into the box to help reduce noise. They are 3/8 inch long, have in inner diameter of 1/2 and an outer diameter of 1 inch. 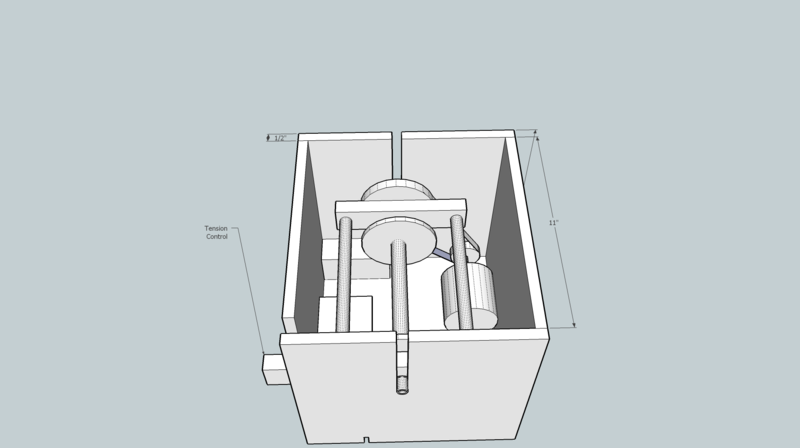 The important part here is the inner diameter and the other 2 dimensions could change if needed. I had to cut out a notch so the pipe that holds the bobbin could slide into these. The bobbins are no longer made using aluminum pipe. They use 2 short pieces of this nylon tubing as spacers. 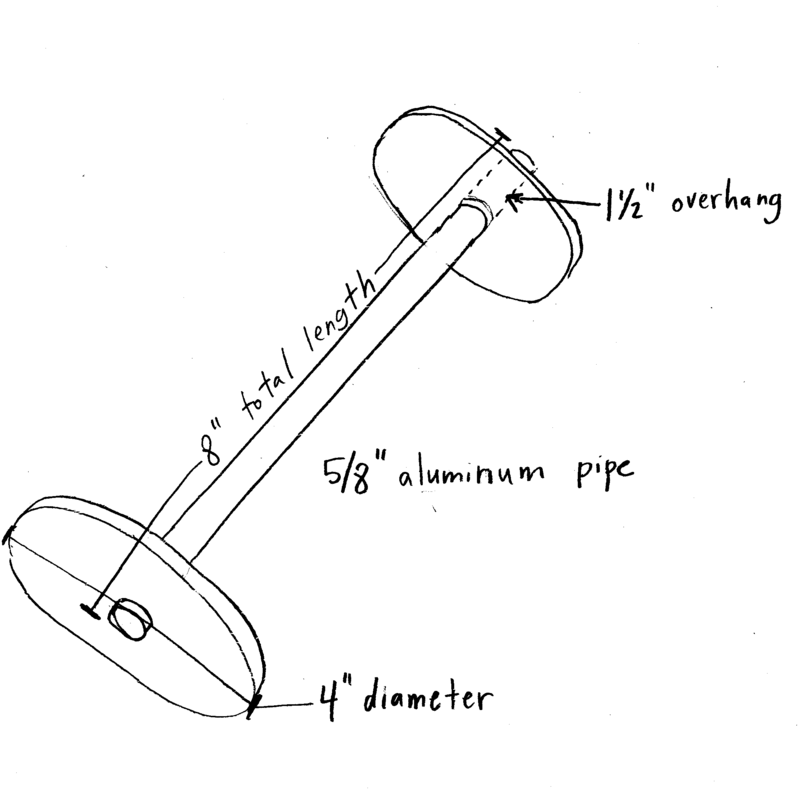 You need to run a 1/2 inch drill threw these spacers a few times so they spin freely on the 1/2 aluminum pipe. Then these spacers are glued into this larger nylon tubing. Then just like before you put some wooden circles onto the bobbin and your done. Our Coastal Natives here on Vancouver Island in CORRUPT B.C. Canada have been using this types of spinner for years-originally attached the bobbin and flyer to a treadle sewing machine. Then treadled to provide power, now they use a small electric motor mounted on the frame of a table. I have a Wee Peggy spinning wheel that Iwould like to convert to electric. I am now in a wheel chair and do not have the use of my legs.Is it possible to just convert it? Thanks.Betty. I’m sure this is possible, but generally to do a conversion take a lot of extra time since there is specialized work for the conversion. To get this done you’ll either need to do some learning about electronics and mechanics or find a friend you wants to help out. from the reel to my cutting machine (15 feet away). pull the wire to my cutting machine ..
reel in bunches cut of 100 or so …. with a “speed control” also. Can you set up help us in any way to develop our own? Kindly advise. You assistance is most appreciated. I don’t see the battery in any of the pictures (only shows in the drawing above). 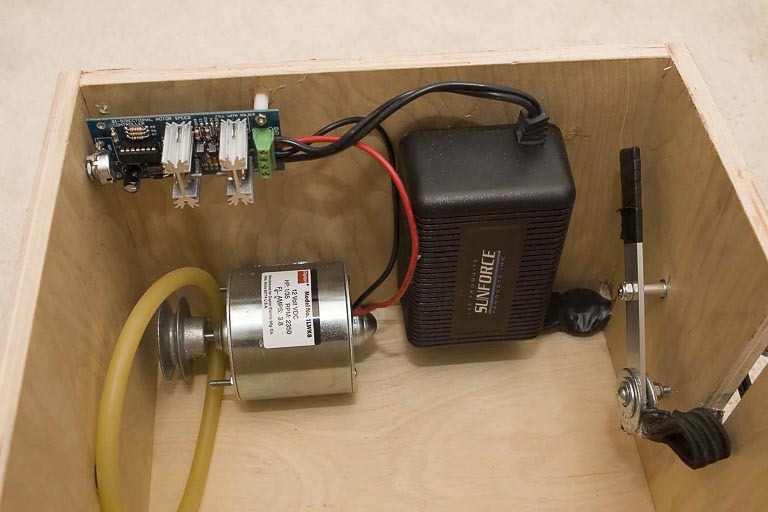 Is the battery needed to protect and sink the energy from the SyRen regenerative motor driver or can the spinning wheel be built using just the 120v to 12 volt converter? Hi, was wondering if you could help me with this problem. When I double ply in reverse, the hook holding the yarns slides down too quickly. How do I set the tensions to slow it down? So, all you need as far as the electrical stuff goes is the motor, motor control, battery, and battery charger? and the links are in plans 4 and 5? 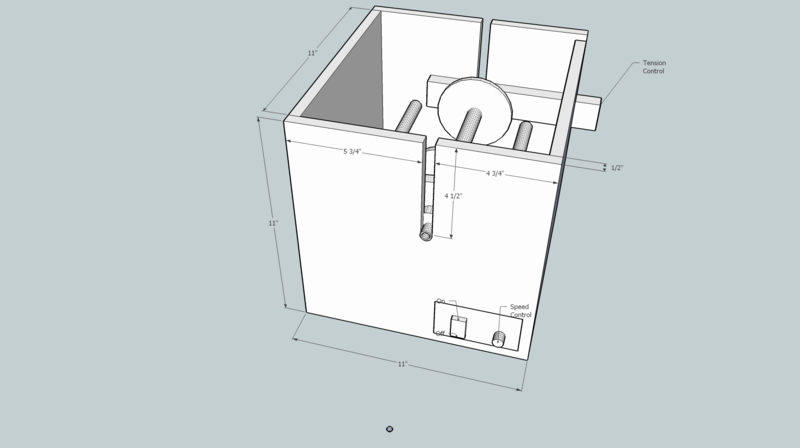 I recently bought the Eel wheel and has set it up according to the documentation in this website. However, I just can’t get the correct tension into my yarn. The problem is that is gets overspun. I thiought that it would be fixed by tightening the scotch tension but when I tighten it enough everything stops and if I loosen it just enough so that the bobbin can move the yarn gets overtwisted since the uptake is too slow. Does it make any difference which side of the flyer the yarn is spun onto the bobbin? Do you have any solution for this? Hopefully you understand what I mean :o) Thank you. There is a fix for this. I found out after shipping out some kits that some of the spacers you put in the bobbin were slightly smaller than they should be making it so they don’t spin freely. The fix is to use something to make the holes in the bobbin slightly larger so everything spins freely. You can use a file, dremel, drill or anything else that will get the job done. Once these holes are slightly enlarged the bobbin will spin freely and you will need much less tension to get it working properly. I’ve checked the two bobbins I have and there’s actually a slight difference in the inside diameter between them in the spacer end. I will make the hole in the smaller one a bit larger and see if that solves it. Thank you! Hello! What I’d like to do is use an existing flyer/bobbin/maidens assembly from an Ashford Traditional, and electrify it. Any thoughts/suggestions/?? I own the Eel wheel 2, but I travel a lot to shows and would like to get a battery pack. Any ideas about makes, models, or where to get one? I saw what you said about using a sewing machine motor and took a good look at the photo of that spinner. I made my own using a sewing machine motor and a bigger homemade (5 inch) pulley, it works purfectly for me. My guess is that you should have applied a little bicycle machanics (invovling gear ratios to be spacfic) to your spinner. Also I do not trust the way you attached those carry straps. Thank you so much for posting these plans! My boyfriend and I are going to try this out. Could you repost a link for the motor? The one listed isn’t brining up the page anymore. Ditto on the re-link request for the motor – the only part i haven’t acquired yet ! Sorry, I don’t know where to get a similar motor. Thank you for sharing. Got arthritis and have to go to e-spinner. Hate to buy all new bobbins when already have a spare-mother of all. My gear is all Kromski. I need clear view, and reach of the spindle. If I enclose your latest motor under the mother of all, instead of in the box to the side, leave that bottom compartment back end open for ventilation, do you think it might have an over heating problem? How much space do you think it ought to have? Your electrical expertise input would be appreciated! Thank you for making it possible to build one at home! Really you are a genius and I like the work you are doing. Thanks a lot. I was so excited to find your electric spinning wheel. The directions from scratch are thorough, and overwhelming, but I could handle a kit if you ever decide to make one again. PLEASE! How ’bout specifics you were looking for in a motor so I can look for one myself? Hello, Can this design handle thicker yarns (up to 1/4 or 3/8 inch)? Also, are you still selling the kits? I don’t know anything about machinery and need all the help I can get. I have not heard from you,do you have the new electric wheel yet? Not yet. It’s taking a lot longer than I thought to get the new version complete. It is still a few months away. Ryan, that would be extremely difficult. The twine in your video is much easier than yarn quality rovings to handle and you still see how big, complex, and expensive that machine looked. This is something I thought would be interesting, but I think if I ever tried to solve it the size and cost of the machine would end up outside the range of hobbiest and only make sense for people/companies who sell yarn. Currently most of the automated machines are house size. I might be able to target table sized instead. I would also probably have to invests large amounts of money and years of my life designing it. It’s interesting, but I’m not sure if I’ll get to it. Thank you for the design. I made this for my wife’s birthday and it came out great. The designs were well planned and easy to follow.